Hello, I am stuck on the following problem: Find an angle between 0 and 2π that is coterminal with the given angle. 12 The issue I have is that the number 12 does not indicate degrees, so I am assuming it is in rads already? I am not sure how to find the angle. Aug. 26, 2017, 11:40 p.m.
Hi there, Nadeje. I would say that your assumption that the given number would be in radians since it doesn't have a degree symbol. However that's kind of a strange number to choose. 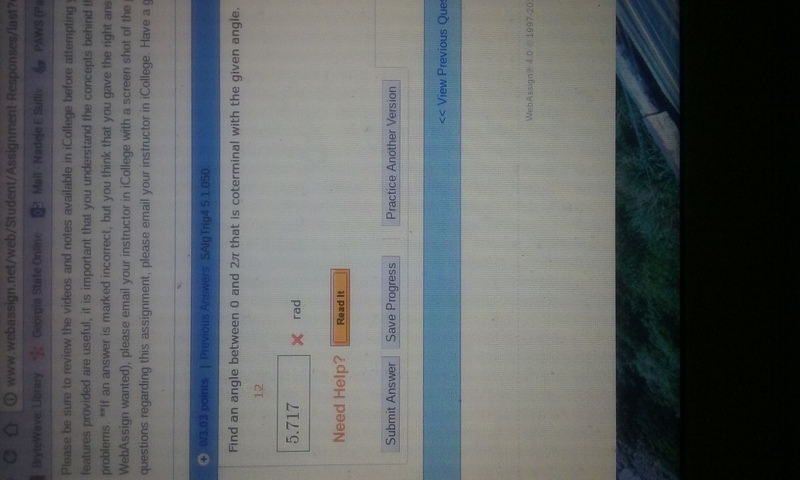 Would you kindly reply to my comment with a picture of the problem? Thank you. Also, are you having trouble with the concept of coterminal angles? Thank you for your response! No-- I have been able to catch on to all of my other coterminal problems, but this one has me stumped. Aug. 26, 2017, 11:52 p.m. Thank you for your response! No I have to say that I have been able to catch on to all of my other coterminal problems, but this one has me stumped. That is interesting... maybe try putting in 12 - Kπ, where K is the number of pi's you're subtracting from 12. That should give you an "exact" answer. Thank you, Jay! Yes that was correct. They wanted you the equation that would represent the 0-2pi angle instead of the solved answer. Thank you for responded so quickly with this problem! You are very welcome Nadeje :) Good luck with the rest of your semester, and don't hesitate to ask us more questions.